There are believed to be many causes of acute laminitis and the “exact” cause is not always known in every case. Some horses can develop laminitis from being over worked on hard surfaces, commonly known as “road founder”. 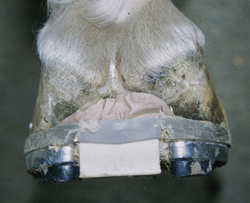 Other horses have been known to develop acute hoof pain and laminitis as a result of excessive trimming of the sole around the distal border of the coffin bone. You may hear terms like “Grass Founder” or “Grain Founder” that are associated with the excessive consumption of fructan (from lush pasture grass), starch (from excessive grain) or other carbohydrates (some mixed feeds or grass). Too much of any of these components has been said to cause a gastrointestinal disruption that somehow leads to the development of laminitis. According to Dr. Chris Pollitt from the University of Queensland, pathologies involving the gastrointestinal tract appear to be the most common causes of laminitis. However, there are still other non-foot and non-GI related causes such as a retained placenta, endotoxemia, and horses that “tie-up” severely. Many of these conditions and how they affect the laminae are not fully understood, only that the increase in heart rate, fever, sweating, colic, diarrhea, rapid breathing, and stress seems to increase the chance of pain in the foot. When pain and inflammation of the bone starts, it is believed to be responsible for the involuntary and uncontrollable tension in the flexor muscle and deep digital flexor tendon (DDFT), putting more strain and pain on the laminae and sole corium. If the pain and inflammation is not controlled, hoof wall separation, vascular disruption, and sinking is likely. In cases of “Founder” or “Chronic Laminitis” you will hear the terms describing the condition as rotation or sinking. These are basically descriptions of how the coffin bone is responding to the hoof wall. Rotation is the most common type of hoof wall movement and in most cases is easier to manage, as the proximal aspect of the coffin bone and the hoof wall maintain their relationship, and only the distal borders are being leveraged apart. The term “Rotation” has commonly been used when the dorsal surface of the coffin bone stretches or separates its distal (bottom) attachment from the hoof capsule and appears to rotate downward. (Figure 1) As a rule, the coffin bone maintains its general position relative to the ground. The displacement of the hoof capsule is dorsal and proximal (forward and upward). The tipping of the bone that is seen later is generally a result of extra heel growth. Separation or rotation measurements can be very slight (2° to 5°) or quite severe (15° to 18° or more). Some veterinarians will base the prognosis or their decision to euthanize upon the amount of rotation. The most common technique for measuring rotation is to measure the angle between the dorsal (front) surface of the coffin bone and the dorsal (front) surface of the hoof capsule. Although this method is useful and widely accepted, common non-laminitic hoof capsule distortion is not always considered. For example, a horse could be diagnosed with 5° of rotation but not actually have rotation or laminitis. We commonly see horses with hoof capsule distortion where the laminae and wall have become stretched causing a non-parallel relationship between the dorsal surfaces of the coffin bone and hoof capsule, however no clinical signs of laminitis are seen. Club feet that have been poorly managed are a good example of this. Another common radiographic evaluation used for laminitis is to measure the distance between the dorsal surface of the hoof capsule and the dorsal surface of the coffin bone. You may hear this referred to as “horn-lamellar zone width (H-L Zone)”, “hoof distal phalangeal distance (HDPD)”, or “separation”. Normally a 1000 lb. horse might have an H-L Zone of 15mm – 17mm. The greater the amount of separation often corresponds to a poorer prognosis by many veterinarians. Although the degrees of rotation are still more widely discussed, the amount of separation seems to offer a better correlation between the severity of the laminitis and the resulting prognosis. Keep in mind that it is critical that you understand the horse’s condition by gathering as much information as possible before determining the horse’s fate. The decision should always be based upon more than just the measurement of rotation and separation. The speed at which first aide is applied to the foot, how quickly the coffin bone becomes stable, how much circulation is compromised, and the amount of coffin bone loss are all factors that need to be considered. The sooner the condition can be safely addressed the better chances the horse will have of returning to soundness. Laminitis cases that are termed “sinkers” tend to be the most complicated cases. This condition occurs when the coffin bone loses most of it attachment to the hoof capsule and moves distally (downward) in the hoof capsule (or the hoof capsule moves proximal to the coffin bone). 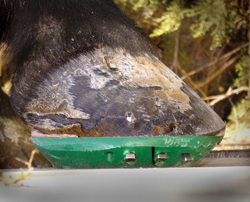 (Figure 2) The amount of hoof capsule separation from the bone (H-L Zone) is also used as part of the diagnostic evaluation. Another evaluation that seems to be more appropriate for sinkers is to measure the amount of distal displacement of the bone within the hoof capsule. With radiograph markers that are properly placed so that the hairline is clearly identified, a measurement is taken vertically from the hairline to the proximal end of the extensor process of the coffin bone. Many domestic horses seem to have some distal displacement that is considered normal (up to 10mm or ½”). However, if the amount of distal displacement is 18mm (3/4”) or greater then the chances for a full recovery are less likely. For many cases of laminitis, the Styrofoam® and/or foam podiatry pads are used for anywhere from 1 week to 4 weeks depending on the horse’s progress. In some cases horses do so well with first aid treatment that they become sound enough to finish the recovery period barefoot. It is important that they have sustained or developed enough sole thickness to provide them with adequate protection. It is also important that they are able to walk comfortably and land slightly heel first to be a good barefoot recovery candidate. If they are not a good barefoot candidate as they recover, then the application of a treatment prosthetic is often required for several months to a year before the horse can comfortably go barefoot or back to standard shoes. With most cases of laminitis, we do not recommend attempting to apply shoes or another enduring prosthetic until the horse has become fairly stable and is off any pain altering medications. Horses in the acute stage of laminitis and are an Obel Grade III lame or higher will have difficulty holding their feet up for long periods of time, and the shoeing process itself adds a certain amount of stress that can re-ignite the condition. As far as pain medications, we prefer to not have the horse’s pain being masked when shoeing because it can be difficult to make adjustment that are critical to insure a positive direction of treatment. Of course, the final decision on any medication and/or treatment application must be discussed and authorized by the attending veterinarian. If a horse with laminitis has done well with the first aid treatment that offers caudal foot support and coffin bone protection (which most do), then try to employ that same approach into the more permanent treatment application. The majority of laminitis cases do well with evenly distributed caudal foot support, clearance and protection for the distal border of the coffin bone, and reduction of leverages in both forward and lateral movement. The ability to make adjustments to frog support is critical in some case. The capacity to fine tune the tension on the DDFT by way of heel elevation adjustments is a must with most cases as well. However the farrier and veterinarian need to decide how to accomplish these goals. In general, E.L.P.O. members find that most of the primary tasks can be accomplished using the Equine Digit Support System* (Figure 3 & 4) or Steward Clogs* (or wooden shoes) (Figure 5) with adjustable wedge rails. Sometimes in cases of sinkers, an EDSS* Cuff shoe may be a more appropriate choice over the standard EDSS shoe. 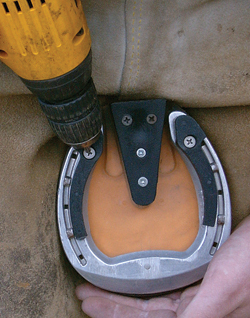 Many farriers and vets have gotten by with just using rolled toe shoes, frog support pads and impression material. Keep in mind that you do lose the ability to make adjustments with that combination. Also, if the pad is not riveted into the seated our area of the shoe, then sole clearance is not guaranteed like it is with the EDSS shoe and pad, or with the Steward Clog. You will run the risk of dirt getting wedged between the shoe and pad at the toe and causing a pressure necrosis. Therefore, it is important to carefully consider the treatment tools you are using so that you have the best chance of meeting the needs of the foot. Taking shortcuts early on will lead to irreversible damage that can negatively affect the overall outcome. Grade I: At rest the horse will alternately and incessantly lift the feet. Lameness is not evident at a walk but a short stilted gait is noted at a trot. GradeII: Horses move willingly at a walk, but the gait is stilted. A foot can be lifted off the ground without difficulty. GradeIII: The horse moves very reluctantly and vigorously resists attempts to have a foot lifted. GradeIV: The horse refuses to move and will not do so unless forced. 0: Lameness not perceptible under any circumstances. 3: Lameness is consistently observable at a trot under all circumstances. 4: Lameness is obvious at a walk. 5: Lameness produces minimal weight-bearing in motion and/or at rest, or a complete inability to move. *Disclaimer: Styrofoam Support Blocks, EDSS & Steward Clogs are commercial products in which some technical advisors and contributor to this article may have a commercial interest. However, noted use or common recommendations for using any commercial products in articles on this site are scrutinized by the board of directors. Using commercially available products in the treatment and prevention of lameness in horses is a standard practice for almost all hoof care providers and the E.L.P.O. will make mention of certain products based on collective recommendations for those found to be relevent and successful.